Ladysthumb (Polygonum persicaria) is a dicot weed in the Polygonaceae family. In Norway this weed first evolved resistance to Group B/2 herbicides in 2009 and infests Spring Barley, and Wheat. Group B/2 herbicides are known as ALS inhibitors (Inhibition of acetolactate synthase ALS (acetohydroxyacid synthase AHAS)). Research has shown that these particular biotypes are resistant to tribenuron-methyl and they may be cross-resistant to other Group B/2 herbicides. Greenhouse, and Laboratory trials comparing a known susceptible Ladysthumb biotype with this Ladysthumb biotype have been used to confirm resistance. For further information on the tests conducted please contact the local weed scientists that provided this information. There is no record of differences in fitness or competitiveness of these resistant biotypes when compared to that of normal susceptible biotypes. If you have any information pertaining to the fitness of Group B/2 resistant Ladysthumb from Norway please update the database. Kucharski, M.. 2008. Populations of Polygonum spp. resistant to photosystem II inhibiting herbicides in South-Western Poland. Journal of Plant Protection Research 48 : 337 - 345. The aim of conducted research was the identification of resistance and cross-resistance of Polygonum aviculare, P. convolvulus and P. persicaria to photosystem II inhibiting herbicides (atrazine, simazine, metribuzine, metamitron, linuron, lenacil, bentazone and chloridazone). The research was conducted as monitoring tests. During eight years (2000-2007) seeds of weeds were collected from 243 fields in South-Western Poland. Resistance of biotypes was diagnosed by biological tests (evaluation of phytotoxicity, measurement of fresh plant mass and calculating of resistance index) and fluorescence method. Identified biotypes showed, in most cases, high level of resistance (IR>6). Most of Polygonum biotypes were resistant to herbicides from triazine group (artazine, simazine, metribuzine and metamitron), lenacil and chloridazone. Resistant biotypes of Polygonum were identified on 15-20% of monitored fields. Participation of resistant biotypes, for all monitored fields, in Polygonum communities did not exceed 40%. On monitored fields also several cases of cross-resistance was determined. Polygonum biotypes were resistant to atrazine and other triazines (simazine, metribuzine and metamitron), atrazine-lenacil and lenacil-chloridazone..
Rola, H. ; Rola, J. ; Kucharski, M. ; Marczewska, K.. 2004. Crop protection against herbicide resistant weeds. Progress in Plant Protection 44 : 339 - 346. The occurrence of weed resistance to herbicides is supported by the long-term action of persistent herbicidal ingredients on arable land. In Poland, using the bioassays and chlorophyll fluorescence methods, some species of weeds resistant to active ingredients of herbicides were identified. Amaranthus retroflexus, Chenopodium album, Echinochloa crus-galli, Solanum nigrum, Euphorbia helioscopia, Digitaria sanguinalis, Polygonum convolvulus [Fallopia convolvulus], Polygonum persicaria, Lamium ssp. and Sinapis arvensis resistant to photosynthetic inhibitors were identified in maize and sugarbeet crop. In winter wheat crop, biotypes of Apera spica-venti and Centaurea cyanus were resistant to chlorsulfuron (ALS inhibitor). In this paper, authors recommend other herbicides and active substances which showed a good control of resistant weeds in maize, sugarbeet and winter wheat crops..
Rahman, A. ; Sanders, P.. 1996. Succession of weed flora in some New Zealand asparagus crops. Acta Horticulturae : 279 - 284. The weed flora of most New Zealand asparagus crops has changed rapidly due in part to cultural practices but largely due to the repeated use of herbicides. The weed composition in the early establishment phase of most asparagus crops consists of many annual broadleaf and grass weed species, of which only five or six broadleaf and two or three grass weeds dominate. The spectrum of weeds varies with both climatic and soil (mainly texture) differences and the numbers reach several million seedlings/ha in some cases. As these common weeds are removed by cultivation, or more often by herbicides, the composition shifts to warm-zone perennial grasses, e.g. Paspalum spp. and Cynodon dactylon. Broadleaf weeds that have emerged as specific problems are Gnaphalium luteoalbum in fields where uracil or triazine herbicides have been used repeatedly, and triazine-resistant Chenopodium album and Polygonum persicaria as a result of reliance on triazine herbicides. Other particularly troublesome weeds to appear in many fields have included Cirsium arvense, Calystegia silvatica [C. silvaticum] and Convolvulus arvensis, as their growth habits are somewhat similar to asparagus and herbicides do not provide adequate long-term control. Ranunculus repens, a weed of pastures and orchards, has also encroached into some fields, and recently Cyperus rotundus has also appeared in some crops and may prove to be a problem in the future. Research has kept pace in developing control strategies, which are discussed. It is strongly recommended that herbicides belonging to different chemical families are rotated in the weed control programme to slow down the shift in weed composition and limit the development of herbicide resistance..
Al-Khatib, K. ; Kadir, S. ; Libbey, C.. 1995. Broadleaf weed control with clomazone in pickling cucumber (Cucumis sativus). Weed Technology 9 : 166 - 172. Field trials were conducted at Mount Vernon on Sedro Woolley silt loam and Skagit silt loam soil during 1992 and 1993, resp., to investigate the efficacy of weed control (mainly of Senecio vulgaris, Solanum sarrachoides, Lamium amplexicaule, Polygonum persicaria, Matricaria matricarioides [Chamomilla suaveolens], Lamium purpureum, Amaranthus retroflexus, Capsella bursa-pastoris and Brassica kaber [Sinapis arvensis]) using clomazone on cucumber crops. Broadleaf weed control ranged from 80% with clomazone at 0.14 kg/ha to 100% with clomazone at 1.12 kg/ha. Weed control was found to be higher with clomazone than naptalam or ethalfluralin. The combination of clomazone at 0.14 kg/ha and naptalam at 5 kg/ha or ethalfluralin at 1.25 kg/ha gave more than 90% broadleaf weed control. Clomazone caused chlorosis and bleaching on cucumber leaves but plants rapidly recovered. Cucumber yields were higher in plots treated with clomazone alone at 0.14 to 0.56 kg/ha than with ethalfluralin or naptalam alone. Clomazone dose response studies were conducted in weed-free plots with five cucumber varieties. The 0.28 kg/ha rate caused low levels of visible injury and did not decrease yields. Cultivar differences were more pronounced at higher clomazone rates. The five cucumber cultivars were, in order of increasing clomazone tolerance, Sunre 3537, Pioneer, Quest, Prince, and Calypso. It was concluded that clomazone is an effective and selective herbicide for broadleaf weed control in pickling cucumber..
Rahman, A.. 1990. Current status of herbicide resistance in New Zealand weeds. : 196 - 200. In New Zealand the first case of true weed resistance was that of Chenopodium album to triazine herbicides, reported in 1982. 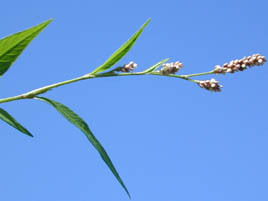 Since then Polygonum persicaria has been added to the list of triazine-resistant weeds. In pastures, differential tolerance of MCPA has been established in different biotypes of Ranunculus acris and Carduus nutans at a few sites as a result of herbicide selection pressure. In C. nutans cross resistance has also been demonstrated between 2,4-D, MCPA and MCPB. Research is continuing on some other suspected tolerance problems and further weed species could be added to this list..